Garlic is an easy crop to grow. You plant it in the Autumn when the air is cool.In the spring lovely green shoots come up from the ground well before any other crops. We decided to invest in garlic as our first cash crop. We’ll be sharing the experience in detail as we go through the process of growing and selling our product. 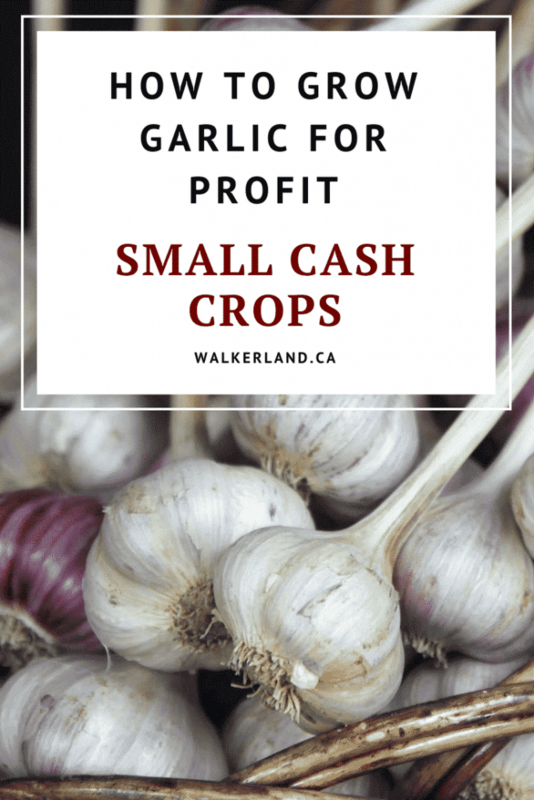 In this article we will talk about why we chose garlic as our first cash crop. We also go over some of the details you need to work out to help you get started with planning your venture. First, we love growing it. We have had good success with our personal garlic crops each year. Our experience on a small scale makes it less risky of an undertaking. If you haven’t grown garlic before, it’s a good idea to grow some test crops to make sure it’s going to work for you. Second, domestic demand is high. Gourmet garlic is extremely popular and there is a shortage in supply. Canada imports over 40,000,000 pounds of garlic every year, mostly from China. We only grow about 3,500,000 pounds. Third, It’s easy to grow. Garlic is space-efficient and simple to plant and harvest. The curing and storing process is also very easy. You don’t have to invest in speciality tools or machinery. Fourth, garlic is impacted by very few pests or diseases, making it extremely hardy and reliable. 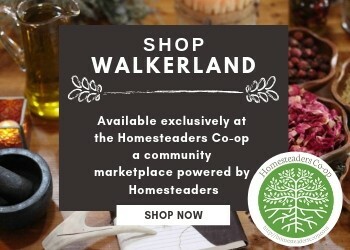 We are busy with running a homestead, growing most of what we eat. We need a crop that does not need constant management. There are plenty of questions to work through and answer before you get started with a cash crop. How much does gourmet garlic “seed” cost? how much land do I need? What tools or machinery do I need? How will I sell it? You might also want to take a look at the garlic farm business planner that Rasa creek Farms provides. It’s a really well thought out tool that can assist you with developing your business plan: Plan your garlic farm. Main crop – the space you need to grow the garlic you intend to sell. 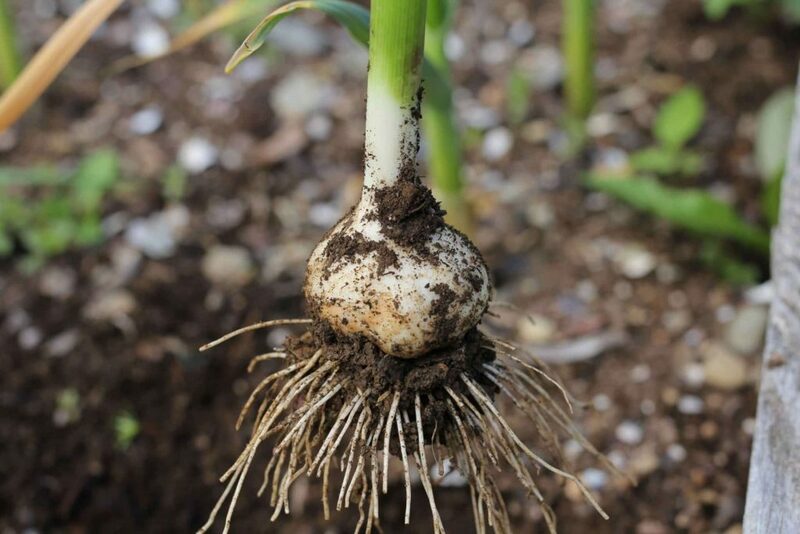 Crop rotation -Garlic should be grown in three year rotations meaning that you need to grow something else in that space for two years following. Planting Stock – If you plan on running a long term operation you need to factor in enough space to grow the garlic you plan to sell PLUS the garlic you require to keep growing your inventory. 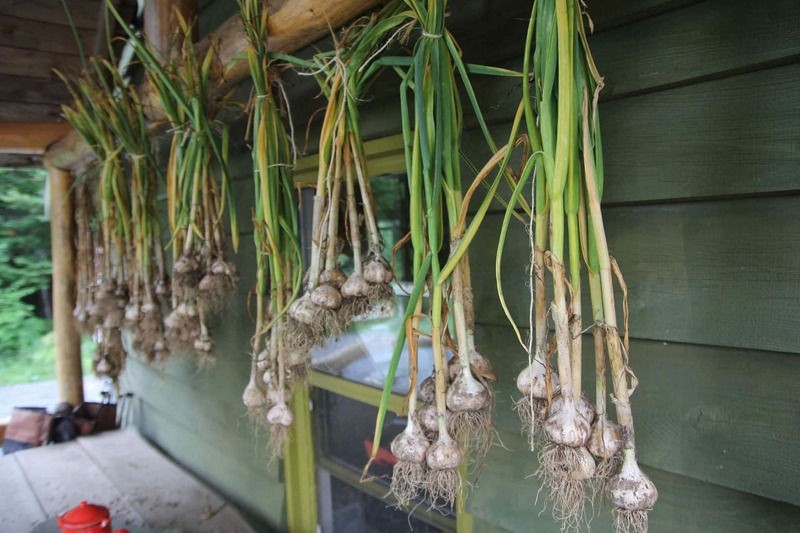 Drying shed – You will need a sufficiently sized, sheltered but well ventilated drying shack to cure your garlic. The garage may work too, depending. You can plant between 6-9 cloves per square foot, but also need to factor in space between rows. We’ve calculated a need for 10,000 cloves for every 1/4 acre. Keep in mind that the number of good sized planting cloves that you will get per bulb will vary between garlic varieties. We get anywhere from 5-7 good sized cloves per bulb, so I average 6 in my calculations. This means that you should end up with 40 cloves per pound of garlic ordered. For every 1/4 acre you will need roughly 250 pounds of garlic (10,000 cloves). You can expect to pay anywhere from $2.50 -$3.50 CAD per bulb for gourmet garlic. I have seen some rare varieties priced as high as $6.00 per bulb. Shop around and ask plenty of questions so that you can find a supplier that you can rely on. Keep in mind that many suppliers of gourmet garlic are small family farms. They are not mass producing garlic. It’s being carefully and sustainably cultivated by people who are passionate about what they do. This means that they can only sell a limited amount of garlic to each customer and they sell out quickly. 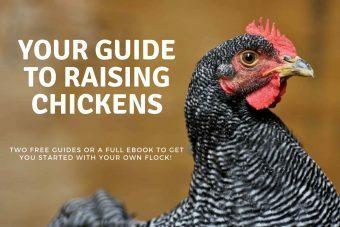 Book your order as soon as possible to avoid disappointment and to help the farm plan for your order. You can save money by investing in a small amount of garlic and multiplying it up yourself. With hardneck garlic you can also allow the garlic scape to flower. The flower is called an umbel. The umbel will produce 50-200 small bulbils that can be planted and grown into garlic. Growing garlic from umbels takes 2-3 years and requires patience. To give us time to prepare enough land for a nice sized crop. To save money and maximize our return on investment. To develop garlic that is adapted to our local environment and soil conditions. If you are interested in obtaining an organic certification, start investigating the process as soon as possible. In Canada it is not cheap to become certified nor is it easy. It can take anywhere from fifteen months to three years to obtain an organic certification and you are required to reapply each year. As a really small operation, this might not be feasible. You are not allowed to state “organic” if you don’t have the certification but you can help your brand and product by providing plenty of information to the consumer about your all natural, chemical free practices. Have a plan and a back up plan for how and where you are going to sell your product. Look into the costs versus potential return for various methods. You need to factor in things like your time, fuel, transportation and other costs associated with each method. Check with other local growers, your seed suppler, the farmers markets and other local sources to gather information on what garlic sells for in your area. The price varies based on how rare the variety is, the location in which you will be selling, organic certification and the method of distribution. Thanks for all your knowledge!! I admire your life style! Love growing garlic. My personal plot has tripled since first starting 3 years ago. My main goal was to grow for personal seed stock and then sell. I need/want more varieties now 🙂 Easy and fun to grow, even for the kids. Thx for the info!